This issue of Hematology/Oncology Clinics, guest edited by Drs. 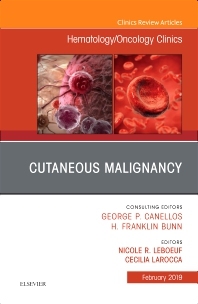 Nicole R. LeBoeuf and Cecilia Larocca, with consulting editors George Canellos and Franklin Bunn, will focus on Cutaneous Malignancy. Topics include, but are not limited to, Squamous Cell Carcinoma, Basal Cell Carcinoma, Melanoma, Malignant Neuroendocrine Tumors, Mycosis Fungoides/Sezary Syndrome, CD30+ lymphoproliferative Disorders, Rare Cutaneous T Cell Lymphoma, Cutaneous Involvement of Hematologic Malignancies, Cutaneous B Cell Lymphoma, Adnexal Tumors, Extramammary Paget’s Disease, Cutaneous sarcomas, and Cutaneous metastases.